Campbellton N.B: Tribune Publishers Limited, 1950. Hardcover. Near Fine/Poor. 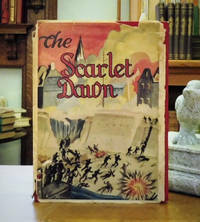 The Scarlet Dawn, Hickey, R.M. Rev. Published by Tribune Publishers Limited, Campbellton N.B., 1950, Second edition. Signed, Dated Inscribed By Author. Red cloth boards with gilt spine and front titles. Volume is in fine condition: boards have only minimal wear with one tiny bump right bottom corner; binding is firm, text block is clean, without markings, tears, folds etc. Un clipped dustjacket is in poor condition; front leaf is detached but complete; large chips, open and closed tears; front pictorial is in good condition.. Size: 8 vo. 277 pp. Account of the World War Two experiences of the chaplain with the North Shore Regiment Of New Brunswick, . Father Raymond Myles Hickey, 1905-1987. Rev Hickey and his regiment were part of the D Day Landing in Normandy. Very Scarce Title. Campbellton, New Brunswick: Tribune Publisher's Limited, April, 1950. Second Edition. Hardcover. pp. iii, 277. 8vo. Bound in rull red cloth with gilt lettering to spine and front board. Light edgewear, contents clean and unmarked with tight, sound binding; very good+ in poor dustjacket.